I used to be a painter. I was never a really good painter, so the discontinuation of that part of practice some seven years ago was not a big loss. That being said, I am often reminded of how much I owe to my humble/clumsy painting beginnings. While still in my post-painting undergraduate studies, I would often frequent the Art Institute’s Abstract Expressionist rooms for comfort and solitude between classes or after an emotionally draining critique. I distinctly remember visiting a long, narrow room that existed upstairs in the pre-modern-wing building that housed only five or six paintings at a time. This room would often rotate works by Ad Reinhardt, Joan Mitchell, Mark Rothko, or Paul Kline. 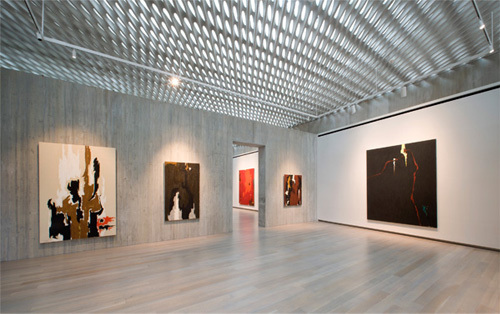 However, a permanent fixture in this space were always two massive, wall-sized paintings by Clyfford Still. 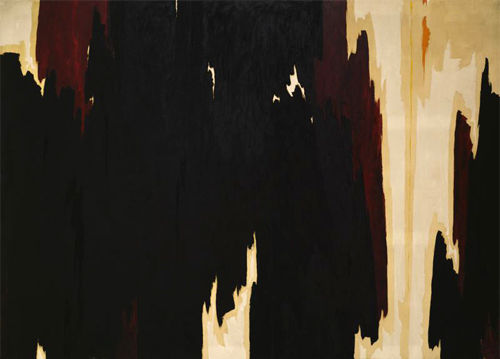 Both works – which are currently not on display – employed Still’s signature nocturnal black, but one was interspersed with scars and crevices of cream, red, and yellow; colors that now seem “out-of-the-tube” but were hand mixed by Still in the early 1950s. These two pieces were fantastic evidence of Still’s meticulous pallet knife work, and the dense murky black of 1951-1952 (almost none of Still’s work had titles) the heavy layering created a remarkable sombre darkness that would engulf a viewer, creating a void primed for personal exploration and meditation. I would sit on the bench that bisected the room longways feeling as if a white noise reverberated between these two pieces; a stoic frequency bounced between them that only a metaphysical shortwave radio could dial into. During ideal viewing sessions – times when the museum was near closing hours, or during particularly cold winter weekdays that deterred visitors – the power of sitting between these facing works would create the perfect mental vacuum to delve into deep contemplation. In those moments, I felt as if the subtlety of texture and composition that existed in these works acted as mirrors for the complexity and nuance of my own burgeoning artistic voice. That sense of belonging amidst those two works would bring me back countless times, and made me a life-long appreciator of Still’s oeuvre. So, perhaps needless to say, it is with some bias that I came to the press preview of the Clyfford Still Museum in downtown Denver. The dense concrete cube, designed by Brad Cloepfil of Allied Works Architecture, is located just behind the iconic Hamilton Wing of the Denver Art Museum almost serving as an architectural antithesis to Daniel Liebeskind’s hyperactive bravado. The subdued practicality of the museum does a great service to the new home for 94% of Still’s life work, allowing for the fabled 300 days-a-year Front Range sun to filter through the perforated ceiling with the help of motorized shades and diffusing glass. During the press conference, Cloepfil discussed how he imagined the materials of the building being “compacted” into the earth to ground the museum in an act of homage to the organic palette found within the 2400+ pieces of the collection. The density of the concrete delicately avoids being cumbersome due to the airy quality of the nine galleries found on the second floor. Almost all elements of the building – from the low ceiling lobby, to the publicly available storage facilities – faithfully serve the ambition and sincerity of Still’s six decade career that started in the prairies of Alberta and ended at his isolated farm in central Maryland. The galleries are delicately filled with key selections from the estate for the inaugural exhibition, and many works on view have had extremely limited public appearances until now. Although the initial galleries that you approach are a bit cluttered with early semi-figurative work from Southern Canada and Washington State, the care taken by adjunct curator David Anfam and museum director Dean Sobel with Still’s more iconic work truly accentuates their undeniable arresting prescience. I was fortunate enough to be led on a guided tour by Anfam of the various facilities that are housed in the museum complex, including a preservation center, a research library, and an interactive timeline. While on the tour, Anfam frequently emphasized how Still, unlike his contemporaries, always prioritized personal cerebral exploration over exhibition and public notoriety. Anfam also took many opportunities to dispel the misreading of Still’s work as masculine grandiosity, and instead argued that the colossal paintings that comprise a majority of his later output came instead from a sincere inward-looking sensitivity to the ways in which post-war America politics and culture were in a state of radical change. In this way, the inaugural exhibition is incredibly successful – to rewrite the dominant narrative of American AbEx is no easy task, and the lasting impression of the museum that has followed me since my visit is that Still’s conscientiousness is evident in an unexpected and rare display. This is not to say that the museum leadership should reward themselves with single handedly changing the contemporary perspective of High Modernism, but the reward of the nearly seven year process it took between the gifting of the collection from Patricia Still to the completion of the museum is unfathomable. The immediate benefit of the museum’s opening is to finally allow for a more wide recognition for an artist – when compared to other giants in the American AbEx pantheon – whose work contains transcendent empathy for the world around him. This quality shines through in Still’s opus, providing a much needed counter to the otherwise stale or remote machismo that typically dominates Abstract Expressionism. The current showing at the museum provides a very faithful testament to a man incredibly in touch with his cultural surroundings; a figure of his era often overlooked but always lingering. Still was not only a contemporary of those more lauded, but was considered amongst that community to be one of the the most generous of teachers and mentors to those around him. 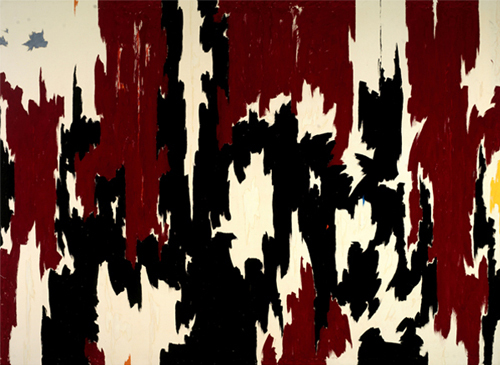 Pollock is famously quoted for saying his work made “the rest of us look academic.” However, Still’s tremendous control over how his work could be shown prevented him from becoming a household name. In 1951 he severed ties from Betty Parsons Gallery and for the rest of his career was notorious known for respectfully declining invitations to participate in exhibitions. One famous account documented in the catalog of the museum is a short reply to Peggy Guggenheim to thank her for his representation at The Art of This Century Gallery and her efforts in championing American AbEx painters, but deciding to cease his relationship with the gallery. This prolonged self-excommunication that spanned Still imposed upon his career is undeniably reflected in the commitment he put into his paintings. As a result the serene – at times overwhelming – spaces that are created within the paintings on display are so enveloping that the very act of removing one’s gaze from their aura is a reeling task. In short, the work chosen by the museum for its first outing is undoubtably mesmerizing and entrancing in their profound melancholia and enlightened earnestness. Where writers and critics of the past have judged these paintings as aloof, remote, and antagonistically abstract, I’d instead argue the opposite and claim that the empathy and humanity found within these paintings remains remarkably poignant, particularly in an artistic age so bereft with pastiche and indifference.